When it was written of Babel that, “If as one people speaking the same language they have begun to do this, then nothing they plan will be impossible for them,” that language might as well have been putonghua. 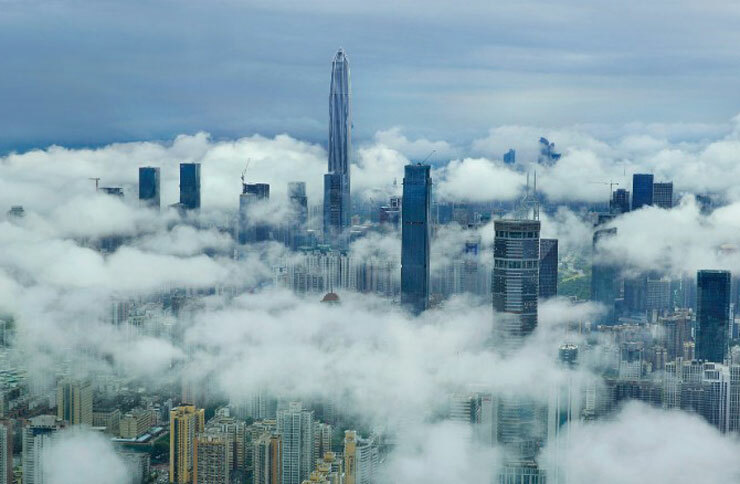 Ping An International Finance Centre, disappearing into the clouds of Shenzhen’s stormy heavens, is just the latest, (almost) greatest in the Middle Kingdom’s super-tall skyline. The second tallest tower in China serves the country’s second largest insurance company, rising 115 floors and 599 meters into the sky. A needle would have put it above the Shanghai Tower, but that would have pierced the paths of passing planes and was wisely scrapped. Now a gleaming pyramid crowns the tower. Started in late 2009 (and delayed one year when inspectors found corrosive sea sand in the concrete), in 2014 it shot up at an astonishing rate of one story every four days. Construction finished in 2016, but the Council on Tall Buildings and Urban Habitat waited until 2017 to certify it as fourth tallest in the world. It was the second year in a row that Shenzhen had the tallest new building (and the most super-talls), in a building boom that sees China with over half the world’s new skyscrapers. Along with the Shanghai Tower, Guangzhou CTF Finance Center, Shanghai World Financial Center and Hong Kong’s International Commerce Center, five of the world’s 10 tallest buildings are Chinese. But though its American architects, Kohn Pedersen Fox Associates, designed it to retain its sheen in the face of sea-born storms – thanks to a streamlined shape deflecting winds by 35 percent and a 1,700-ton stainless steel frame (the world’s heaviest) that resists corrosion and disperses lightning strikes – it may be China’s hunger for height that knocks Ping An off its pedestal. Already there are plans for a Suzhou Zhongnan Center (729 meters) and an unnamed super-tall in Shenzhen’s Luohu District (739 meters) that will dwarf our giant. So speed up the Ping An’s elevators at 10 meters per second to reach the observation deck (reportedly opening on the top floor sometime in 2018) for an unobstructed view of the city before the competition arrives.